Adults have up to 32 teeth, of which four are wisdom teeth and these are the last to come through the gum. They are the one’s right at the back of the mouth and usually appear between the ages of 17 and 25 although sometimes they can appear in later years. If there is enough room in the mouth the wisdom teeth will come through (erupt) in a useful position and there will only be minor discomfort as they erupt. However, wisdom teeth can cause problems if there is not enough room in the mouth, as the wisdom tooth erupts at an angle and gets stuck against the tooth in front; the dentist will describe this as ‘Impacted’. The dentist will be able to assess whether there is sufficient room for the teeth to come through by taking an x- ray which will show the position of the root. 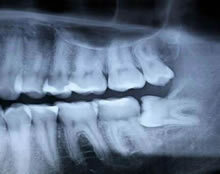 Once the x-rays have been taken, the dentist will be able to tell how easy or difficult it will be to remove the tooth. The dentist will then determine whether the tooth should be taken out at the Dental Practice or by a Specialist Oral Surgeon. 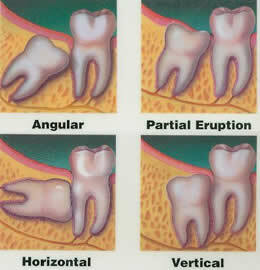 Following the removal of wisdom teeth, there is likely to be some discomfort. However, this will vary depending on how difficult it was to remove the tooth; it is not uncommon to experience some swelling for a few days. The dentist will advise on how best to reduce this discomfort and may recommend pain killers such as Paracetamol or Ibuprofen. 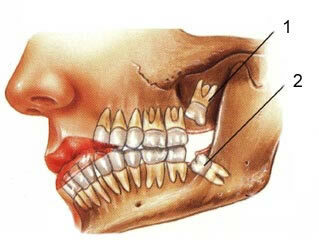 A further dental appointment will be necessary for the dentist to check the healing process and remove any stitches.